Call it a death wish or whatever you want, but the Nokia N900 is taking things to a whole new level that most smartphone CPUs do not dare setting their foot in. 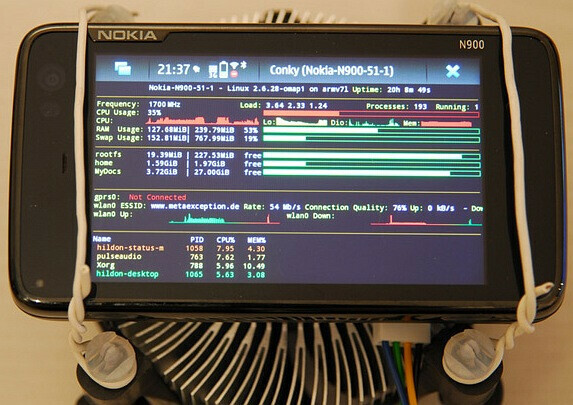 Not only is the Nokia N900 greatly considered by many to be one of the best all-time hackable smartphones, but it was recently seen to surpass itself in terms of processor speed. Generally chugging along quite well and stable at 600MHz, the N900's CPU surpassed its previous pinnacle of 1GHz and broke down the barriers to safely rest upon the 1700MHz mark. One individual took a snapshot of the new record as it is clearly strapped in for the ride of its life – which is to say that it's probably doing more harm than good to the handset. Even if it's difficult to say if the photo is authentic, anyone who even fathoms of getting their smartphone to this level is surely warranting an early demise. As much as this record may stick, the N900 never ceases to amaze anyone on the mind boggling things it can do just to prove people otherwise. Plus it may be more of a power hog and failing on delivery its high speed.... it only looks good on paper! And with the added benefit of 1700mhz you can play next gen mobile gaming......for a total of twenty minutes before your phone dies. who cares if u overclock any cellphone!..if its not done @ the factory and at level frequency to the towers antennas..its useless!! Actually i've read that the cpu operating frequency can have a direct effect on radio antenna frequency. The other issue is going above 70degree's as well as the known battery savaging. But having the ability to tweak to ones desire is a welcomed one but people need to be aware of risks attached. Expensive to find out the hard way. People, we all know it's not safe for your handset. All that's being shown here is that it CAN be done. You people really take yourselves too seriously.